Approaching Ching’anjo village, you could hear the sound of children playing and laughter of women chatting an afternoon away. Greeted by the smiling faces of the children upon our arrival, Stonnard and Judith Raphael a married couple with 5 children offered us a seat outside their home. Sharing the purpose of our visit, we were introduced to a committee member, Leonard Kamphonje for the water point who managed to share the status of the Elephant Pump that was installed by Pump Aid with support from P Leigh Bramwell Trust ‘E’. Since its installation the pump has been operating very well and no major break downs have occurred. “We make sure that it is well greased and that the area surrounding the water pump is well cleared,” said Leonard. The committee was trained on maintenance of the pump and is well informed of where to get spare parts in case of breakdowns. Enquiring from Judith the status of water before elephant pump installation, she had this to share: “Our water source was an old well dug near the water stream. 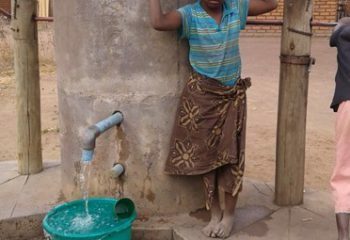 During rainy season, all the dirt was washed into the open well and the water was heavily contaminated. Stomach pains and diarrhoea cases were rampant. During that time, our village had not been taught the importance of having latrines so most people used the bush to defecate. We now have good tasting quality water compared to our old well. At the time of our visit, Judith and Stonnard were glad to share that things had really changed for the community since interacting with a community facilitator from Pump Aid. Most people now are constructing their own latrines and they showed us their own latrine. The couple also shared that they are teaching their children critical times to wash hands, before taking any meals or fruits or any kind of food; soon after visiting the toilet they have to wash their hands and whenever their hands become dirty. 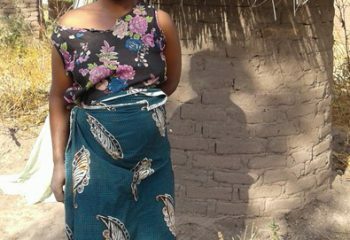 Diarrhoea cases have reduced significantly and not so many people complain of stomach pains. The water that we are now drinking is safe and chlorinated. The couple grows maize, sweet potatoes, groundnuts and vegetables. In addition, Stonnard has a fish pond where he harvests fish for consumption as well as selling. 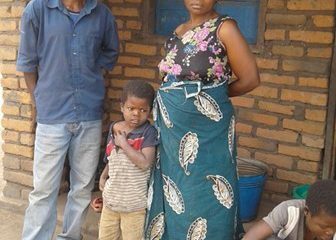 From the fish sales, the couple has managed to construct a house, the have bought a new plot to build another house and they also manage to send all the children, Aefeso, Kachingwe, Hananiya, Alice and George to school with the same money. When they sell their produce this season they are planning to buy iron sheets to roof their current house.